← You Won A Free Cybunny! It’s December! Which means…you can visit the Neopets Advent Calander every day this month to get free neopoints, free Neopets stuff, and maybe even free Neopets paintbrushes! Just go to Terror Mountain, and in Happy Valley you’ll see the Neopets Advent Calendar sign. Make sure to visit it every day in December to get your free neopoints and free neopets stuff! 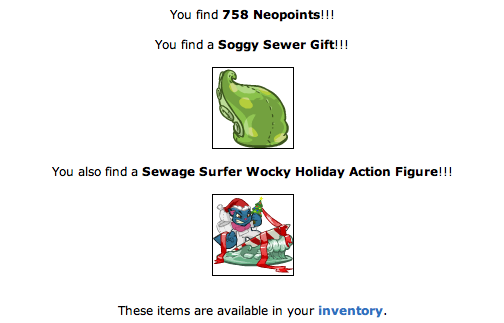 Here’s a tip on making neopoints off your items you receive in the Neopets Advent Calendar: Don’t sell all those items right away in your shops! Since almost everybody in Neopia also received that same item, they’re going to be super low in price right now! SAVE all your advent calendar items for a month or 2 THEN sell them in your shop! The prices will have all increased by then! 2 Responses to Neopets Advent Calendar! what if you have missed a day or more? i have missed five days will i still get my prizes?